The Irish Museum of Modern Art, Dublin, is housed in the buildings that once formed the Royal Hospital for retired soldiers at Kilmainham. Built in 1684 it is modelled on Les Invalides in Paris. A display tells the story of the site and you can dress up in the garb of an old veteran. Slip a redcoat over your shoulders and slap a tricorn hat on your head. 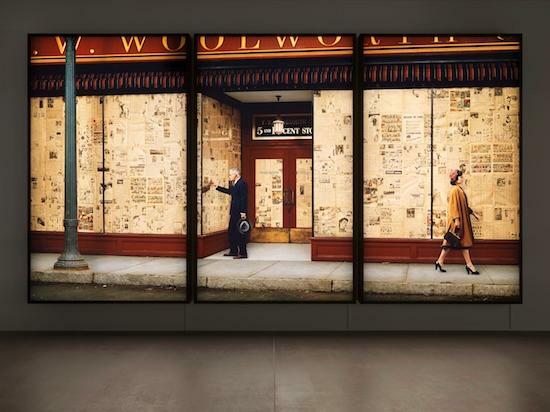 Then look at yourself in a mirror and say, as with the title of Rodney Graham’s show, That’s Not Me. Graham has long poked fun at the idea of identity. Taking Rimbaud’s ‘je est un autre’ mission statement as springboard he stars here as a variety of characters in a terrific sequence of lightbox works. Humour freights his oeuvre – his breakthrough video Vexation Island (1997) set the tone with Rodney as pirate stuck on a desert island. A coconut smacks on his skull in a repetitive loop, a slapstick Nietzschean parable of eternal recurrence. One of his funniest gags comes up first here – in Dance!!!!! (2008) we catch him freeze framed doing a jig in mid-air. He’s dressed in a sober black suit and topper. Maybe he’s the town undertaker. A moustachioed Western villain sits nearby on the top of a player piano pointing a revolver with grim intent at those jumping boots. Another cowboy has his hands at the keyboard. This is the first reveal of Graham’s many musical references. His own fondness for wearing tricorn hats arrives next with Actor/Director, 1954 (2013) where he looks like a figure on a Powell and Pressburger movie set. He’s in sky-blue waistcoat and breeches, white stockings and cream buckled boots. The colours here are intense – an old three-reel Technicolor camera is in copper blue, there’s a hedge as green as an Irish field and then there are the pink apple blossoms, a vision as deliriously avid as any Archers production. The cigarette the star holds tells us that this cannot be the 18th century. The title with its date gives the game away. Graham enjoys time travelling with his ventriloquized personae. In The Avid Reader, 1949 (2011) we see him outside a defunct Woolworth’s, where he peruses the old newspaper pages that cover the windows. He looks like George Clooney, senatorial, a lawyer perhaps. The location is Vancouver – we learn this from the posted pages of the city’s Sun editions with their B.C. headlines. Graham holds a natty trilby to one side; his hair is silver, neatly cut. An elegant woman walks past him, swings a handbag, indifferent to his presence. But is this other Rodney admiring her reflection in the window? Another blague - we learn that the woman is Graham’s wife in real life. Look at the dates in the titles of these works – Graham is clearly obsessed by time, by the past. He tries to imagine himself back then – he gives us an idea of what he would have looked like had he been around in those years. Is he trying to imagine how it felt to work as an artist back then? And so we get images like Artist in Artists’ Bar, 1950s (2016) where he sits at a table staring into space with his pint. An ab-ex macho then, here he wears a plaid shirt and paint-splattered trousers. A canvas wrapped in brown paper sits beside him at the banquette. Above his head the walls are crowded by sub-Picabian abstractions by… well, who? His peers? Or are they by the Rodney character himself? The joke of course is that they are by Graham, Graham as recently as 2016. And what would that ‘I is another’ have been like if, later on, he had been a pal of the likes of Morris Louis, an epigone of Jackson Pollock and the Cedar Tavern gang? This we see with The Gifted Amateur, Nov. 10th, 1962 (2007) – an enormous triptych of lightboxes where Graham slowly drips yellow oil paint onto a large tilted unprimed canvas. He’s barefoot and in dark blue pyjamas. Another cigarette dangles from his lips. His studio looks like Richard Neutra had designed it; open plan with some tastefully exposed brickwork. Three ashtrays overflow with butts. More pages from the Vancouver Sun line the floor. This character is wealthy – he has a new fangled tape recorder, piles of coffee table tomes on Juan Gris, Braque, and Picasso. These lightbox works can be seen as intensely literary in that they inspire speculation, fictive readings. We make stories about these invented self-portraits, still as a Vermeer and as laden with implication. His obsession with obsolescent technology comes to the fore with Basement Camera Shop circa 1937 (2011) where he wears a slim blue cardigan, a pale shirt and neat blood orange slip of a bowtie. His hair is mussed and he looks down through a pair of steel framed spectacles to a piece of paper where he signs a chit with a fountain pen. There’s the musing on analogue technologies of course – we see the Baby Brownie cameras and packs of Kodak film on display. Developing, Printing, Enlarging reads an advert – a neat visual pun on Graham’s own productions. In addition to his pictorial works Graham is a musician. He has released recordings such as Getting it Together in the Country (2000). The cover has him seated with a guitar looking like Nana Mouskouri’s brother. Yet another lightbox – Dinner Break (Salisbury Steak) (2017) – sees him as drummer sitting on his stool, knife and fork raised as he prepares to tuck into his meal. 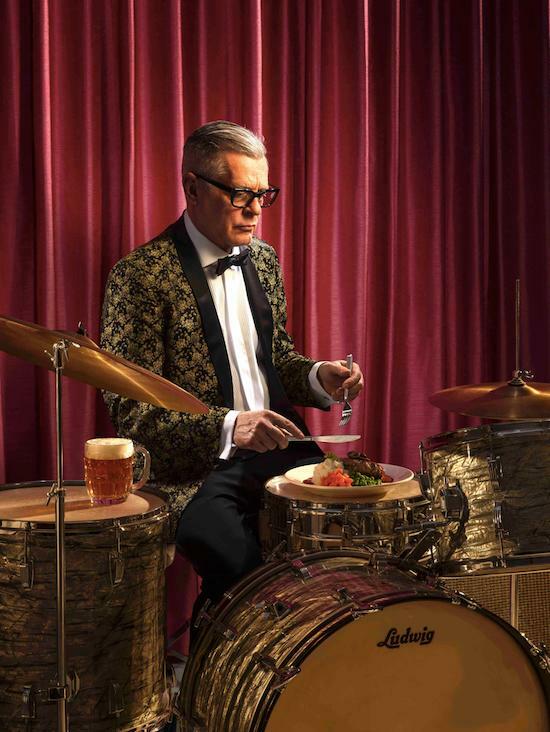 The plate of beef and diced carrots and peas is balanced on a snare, his pint of beer on a floor tom. And with Aberdeen (2000), a sequence of photographic slides taken in the Washington town of that name, he dwells on the birthplace of Kurt Cobain. The bland wooden architecture and lonely wheelie bins give us the desperate flavour of the place and a clue as to why Cobain would seek exile, if not exactly silence and cunning.